For students studying the new Language A Language and Literature syllabus for the IB Diploma. 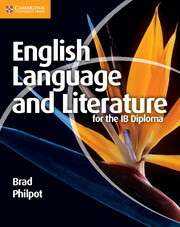 The English Language and Literature for the IB Diploma coursebook is a comprehensive and accessible guide for Standard and Higher Level students of the new Language A Language and Literature syllabus for the IB Diploma (from 2011).Written by an experienced, practising IB English teacher, English Language and Literature for the IB Diploma covers key concepts in language and literature studies in a lively and engaging way suited to IB students aged 16-19 years. This well structured coursebook includes: key concepts in studying language and literature; text extracts from World literature (in English and in translation); international media and language sources; a wide variety of activities to build skills; materials for exam preparation; guidance on assessment; Theory of Knowledge links; and Extended essay opportunities. Structured activities to build study skills in both language and literature. Annotated and deconstructed texts, highlighting media and author techniques. Materials for exam preparation, covering each assessment type with information and guidance on assessment, explaining the syllabus in practice. Theory of Knowledge boxes with question ideas to stimulate thought. Extended Essay ideas linking to Creativity Activity Service explore for Language and Literature. Sample student work, providing examples for reference and criticism alongside definitions of key terms in the margin for easy reference, as well as a fully glossary.